On Day 3 of the CrossFit-USAW Open in Colorado Springs, Coach Greg Glassman was standing in the back looking out over the indoor tennis courts at the Cheyenne Mountain Resort. On his right, a crowd of CrossFitters in singlets were warming up on Oly platforms. 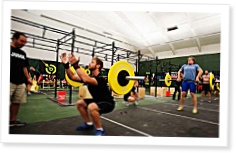 On his left, a pack of bare-chested men were attacking a CrossFit triplet featuring squat cleans, pull-ups and double-unders. Great read Mike, wish I could have been there to see that! If you all notice the picture on the top here of Dave Lipson and the way he is doing his squat cleans, he was actually cleaning up that bar and letting it land directly on his shoulders with no control help from his hands because of a wrist injury he endured while attempting some of his first oly lifts. I was right there watching this in amazement as he was fighting his way through the triplet with a bum wrist, and he still got over 5 rds!! What an amazing athlete he is as is everyone else that competed this weekend. I heard nothing but great feedback from everyone, and I mean EVERYone at this event. From what I heard and what I got from talking with people involved with the USAW community was this is really a historic meeting of the two sports. All of the Crossfitters I talked with were extremely impressed with how precise the weightlifters were with their lifts and the dedication they have to their sport. I think everyone there had an amazing time and the best part was is the atmosphere in the arena felt like every single person checked their ego at the door and came into this with nothing but respect for their fellow lifters. I felt extremely privileged to be able to help volunteer my time to help with this event and watch some great lifting. I really hope they continue to hold this as an annual event. Chad Vaughn you are my new hero! That's great to hear Mike! I was wondering how many people were entered that were strictly Oly lifters and what was there thoughts after doing the triplet. This event was A LOT of fun and I personally learned so much and gained even more respect for the sport of weightlifting. I am glad that I competed and that I got to wear a singlet with all of my friends! Ha!